A weekly podcast about building great relationships, cultivating wonder, and making things better for other people. Hosted by veteran community-builder Bart Campolo, Humanize Me features friendly, thoughtful conversations with a wide array of scientists, activists, artists and oddballs. Humanize Me is a production of Jux Media. Jessica Wilbanks grew up in a fundamentalist Pentecostal church on the western shore of the Chesapeake Bay, and then, at 16, walked away from the church. Ever since, she’s been haunted by the world she left behind and wrote a book about it, just released: When I Spoke in Tongues. In this conversation with Bart Campolo, Jessica talks about growing up in her family, the “loss of an assumptive world” with her loss of faith, having a nervous breakdown in college, transcendent experiences and the Holy Spirit, the early days of Pentecostalism, her mother defending her from an angry pastor, her bisexuality and more. You can also join our Facebook Group. Not a supporter on Patreon yet? Join up at Patreon.com/HumanizeMe and get extra content for it! Humanize Me is hosted by Bart Campolo and is produced by JuxMedia.com. 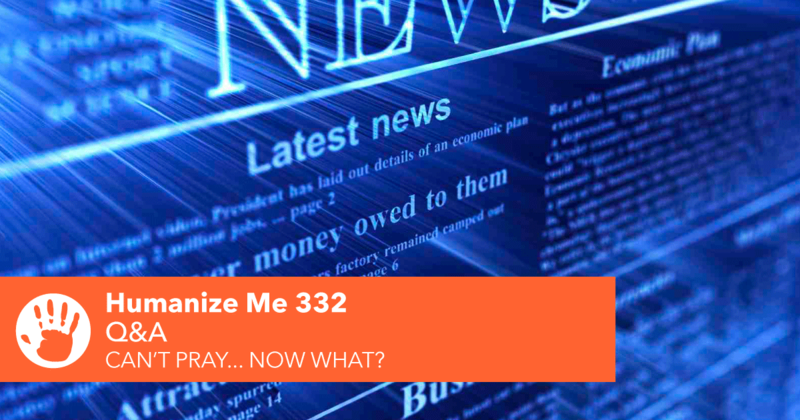 332: Can’t pray… now what? Sometimes, in the face of big problems in the world, doing everything we can do feels inadequate. Bart Campolo begins a multi-faceted answer, but partway through begins to doubt his own wisdom on this. After some reassurance, we see it through to the conclusion: we should do whatever we can, and give ourselves a break about what we can’t. You can also join our Facebook Group – from where this week’s question came! – to hang out with other listeners. Please review this podcast on iTunes if nothing else; it’ll only take a minute. Just say no! That’s the mantra most of us have picked up from authority figures in our lives about drugs of all sorts, no matter their category. 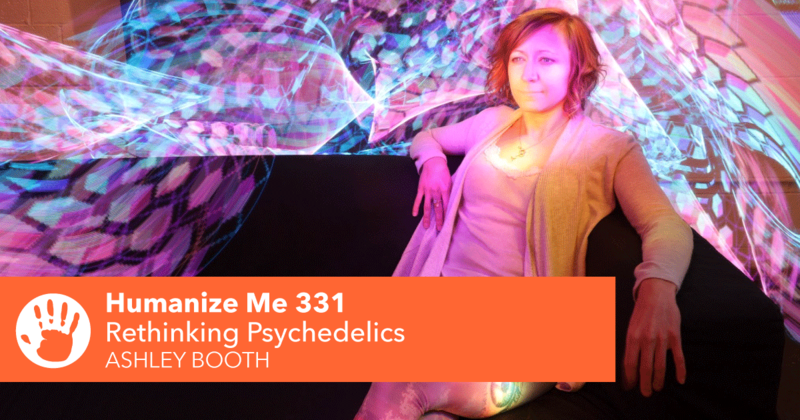 But for our guest Ashley Booth and a growing number of scientists, doctors and thinkers, it’s become clear that our culture threw the baby out with the bathwater when it comes to the usefulness of psychedelics. This particular class of compounds – psilocybin, LSD, DMT and others – is special. They provide strange, unusual forms of consciousness, changing the perspectives of those who take them so much that their experiences can be life-changing. Bart Campolo has never tried psychedelics. But in his project to become more empathetic, more available to love others fully, and to make the most of the one life he has, he has become more and more certain that he can’t afford to avoid psychedelics forever. His conversation with Ashley includes: special usefulness for those with PTSD, anxiety and depression; Ashley’s own experiences; how to interpret the experiences and what they may tell us about reality; how to find a good guide; what scares Bart the most; and how we learn impactful things regardless of whether it’s a fun process or not. Ashley Booth is a scientist, researcher and psychonaut. Her website can be found at AshleyBooth.net and her advocacy community can be found at AwareProject.org. Their guide for would-be participants (mentioned in this episode) can be found at AwareProject.com/Questions. Another of her endeavors can be found at InnerSpaceIntegration.com. Will you do us a big favor and review this podcast on iTunes? It just takes a second and really helps. The link is HERE! Penetrate our clandestine Facebook Group to talk with others about the podcast! We reached 100 supporters on Patreon! Not a patron yet? Join up at Patreon.com/HumanizeMe and get extra content for it! 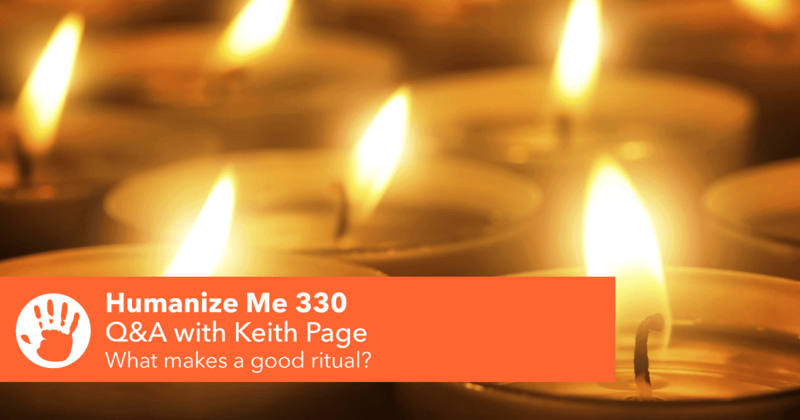 In a first for one of our Q&A episodes, Bart chooses to ‘phone a friend’, a now-secular ‘celebrant’ called Keith Page, and they chew over the idea of rituals. Takeaways: Rituals create order, and a sense of permanence, funerals, weddings, families, birthdays, Alcoholics Anonymous and other things are good examples, rituals of initiation like baptism actually make sense, the best rituals are connected to a value you share, solo rituals too, people need collective practice. Join Bart and John LIVE this Thursday, October 25th at 6pm Pacific over at Patreon.com/HumanizeMe for our monthly livestream video Jam Session, where we break down some recent episodes, review recent topics and guests, try to be as honest as possible about what worked and what didn’t, and throw each other under the bus (in the most loving way possible, of course). Not a supporter yet? Join up and get extra content for it! We’ve almost met our goal of 100 patrons! Be the 100th? Join the conversation on our listener-run Facebook Group to talk with others about the podcast. Don’t worry; if you’ve never heard of ‘evidism’, you’re not alone. 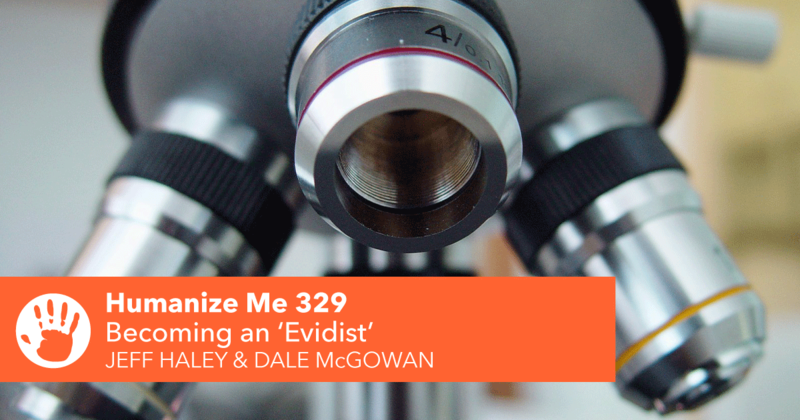 This is a term coined by the guests in this episode, inventor Jeff Haley and author Dale McGowan, to describe people committed to fact-based, evidence-based thinking. In this conversation with Bart Campolo, Haley and McGowan talk about their book, Sharing Reality: How to Bring Secularism and Science to an Evolving Religious World, and their ideas for how to have better, more evidence-based conversations with people who have different worldviews. They talk about how we know fact from fiction, the word ‘believe’, how we know the earth is round, evidence and the resurrection of Jesus Christ, bias and how we must all admit to having it, and how to talk to people of faith. We’ll be having our third Jam Session in the next week or so over at Patreon.com/HumanizeMe. Not a supporter yet? Join up and get extra content for it! We have a goal of 100 patrons… and we’re almost there! You can also join our ‘secret’ (roll-eyes-emoji) Facebook Group to talk with others about the podcast. 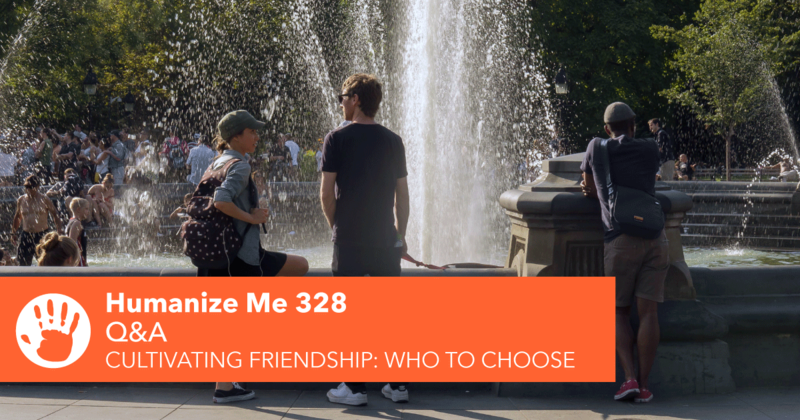 328: Cultivating friendship – who to choose? Takeaways: Shared interests are important, circles are an easier place to start than individuals, complimentary personalities are better than sameness, have an awareness of your own social cachet and keep it in mind, choose kindness over coolness. Infiltrate our top-secret Facebook Group to talk with others about the podcast! ‘Bart’s Book List (Part 2)’ can be found at our Patreon page. Not a supporter yet? Join up at Patreon.com/HumanizeMe and get extra content for it!